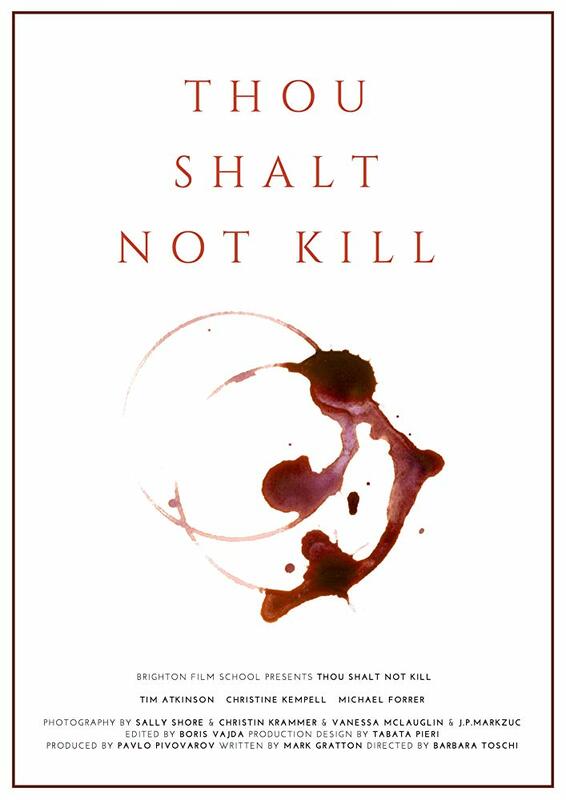 Between many scripts, Thou shalt not kill was the one selected to be made as our final term film for our Diploma course in Brighton Film School. The script was fun and clever and we were all excited to make it. It was a fast turnaround, we had two weeks for pre-production and we shot over two days in a beautiful house in Brighton. Besides the excitement, we were also a bit nervous as none of us were very experienced and we wanted it to go well. That was my first film directing and as you can imagine I was very anxious, but we made a great crew, everyone put 100% of effort and checked every detail in their own department. The filming days were very pleasant and we could see that we were getting where we wanted by our day one. Of course you never know what will happen and one of our main challenges was the shot of the drinks mixing. We couldn’t do it many times so we had to make sure to rehearse and get everything right for the take. Plus we had to be careful to not break the glasses. We got it in our first take and we celebrated as our team were winning the World Cup. I believe it’s fair to say that during the pre-production, for being a student film, we didn’t have such high expectations, so seeing the film getting into festivals now, bringing us job opportunities outside of film school and pushing the career of many of us is very inspiring and it makes realise that it was all worth it. Thou shalt not kill gave me the opportunity to direct Puzzle, my first film outside of school, and some of my crew were the same as we knew we were a good team and we got along very well. So for me, even more important than having the film out there doing well in festivals, is the relationships I created in this project, meeting people that is passionate as I am and working with them over and over again, seeing how we can improve together. I think this is what actually matters in the end and I know this will lead us to a successful path.